Paid Memberships Pro (PMPro) is one of the most popular WordPress membership and subscriptions plugins. It comes with tons of tools and features that provide you with anything you need to run a WordPress Membership website. With Paid Membership pro you can build your own paid memberships website where you can sell eLearning courses, ebooks or any kind of digital products. It works with both one-time payments and recurring subscriptions. If you are using Paid Membership Pro to build your membership subscriptions website you might need a tool to search, filter and analyze your member data. 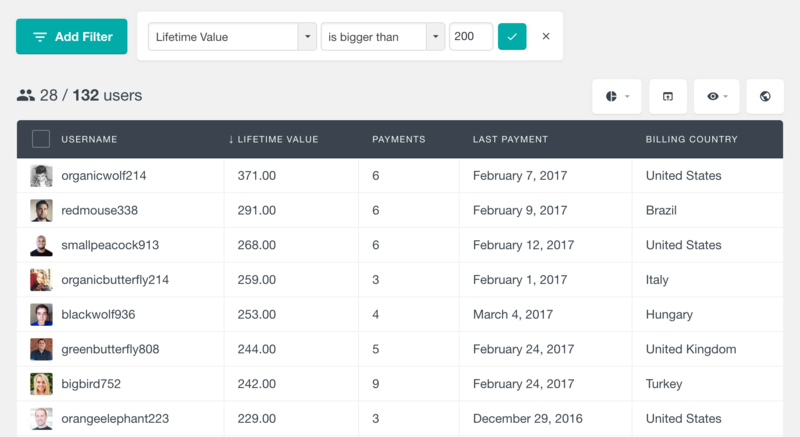 The Paid Membership Pro module of Users Insights provides out of the box integration for the plugin, making it easy to create advanced filters to analyze your member data, so you can get valuable insights and improve your membership business. 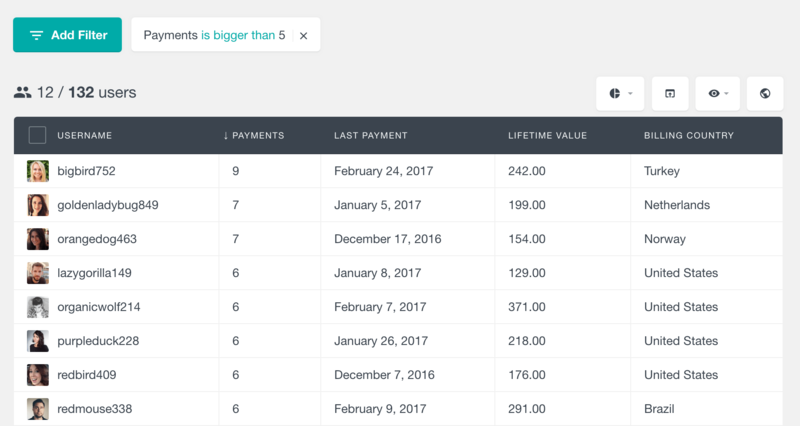 The module automatically detects the member and sales data from the Paid Membership Pro plugin and makes it available in the Users Insights users table and smart filters. Let’s take a look at all of the available fields and filters. One of the most useful fields that the Paid Memberships Pro module provides is the Membership Level field. If your membership site supports more than one level, this field can be very useful to explore the levels that your members are subscribed to. The PMPro Membership level field is available as both a table field and a filter. This means that you can easily filter the users by the level that they are subscribed to. Similarly, you can find all the members who are not subscribed to a particular level by using a negation condition, such as “Level is not Gold”. Another scenario that this filter can be useful is to filter users based on members and regular users. If your WordPress site allows registered users that are not Paid Memberships Pro members, you can use this filter to differentiate between the different types of users. 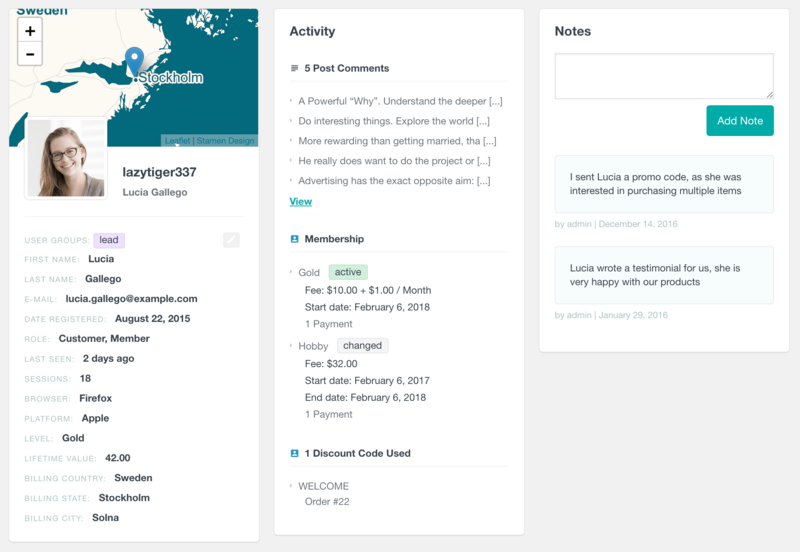 For example, you can use a “Level is set” filter to list your members (existing and past ones). Or you can use a “Level is not set” filter to find the regular users. This is because the Level field would be empty for all the users who have never been members. As its name implies, the Status field indicates the current membership status of the member. The most common Paid Memberships Pro statuses are active, expired and cancelled. 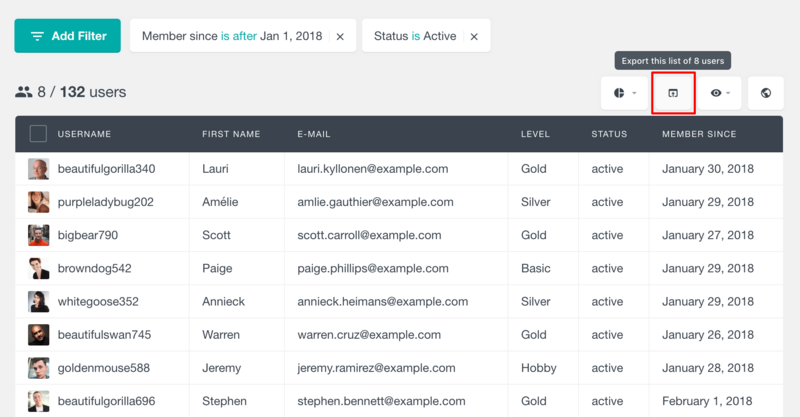 The status field is available in the Users Insights filters, so you can easily filter your users by their membership statuses. When you use this filter, Users Insights provides a drop-down menu to select from all the existing statuses. You can also use this filter to search for members who don’t have a particular status. For example, to find all members who don’t have an active membership, just use a “Status is not active” filter. The Member Since field indicates the date when each user has first become a Paid Memberships Pro member. Regardless of whether the member has changed memberships or paused his membership at some point, this date would always be the date of the user’s first subscription. The Member Since field is a date field, which means that you can sort the user table by this column in a chronological order. You can also filter the member list by this column. For example, to find all the members who have subscribed in the past 30 days, just use a “Member since is less than 30 days ago”. You can also filter the user list based on a date, for example to find all the members who have subscribed before, on or after a particular date. The Start Date field indicates the date when the current PMPro membership has started for each user. This field can be different from the Member Since date for some users. 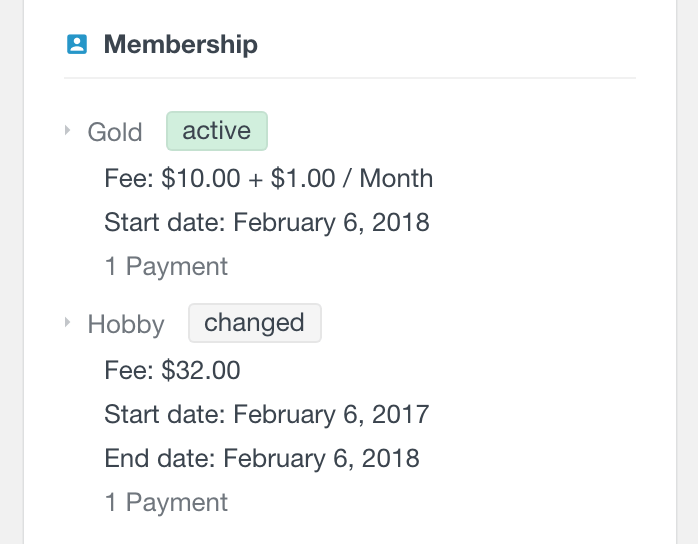 If a user changes their membership at some point, for example changes the level, the start date will indicate the date when the most recent membership has started for this user. In other words, the start date would be the date of the change. On the other hand, when a membership change occurs, the Member Since date will remain unaffected and will still point to the first membership date. Since this is a date field, you can sort the user table in an ascending or descending order by this column. You can also filter the user list by their start date. You can even combine this filter with the Member Since filter, for example to find all the old members who have recently changed their membership. The date that the Paid Memberships Pro End Date field indicates can vary depending on your membership settings and the individual statuses. If your memberships have an expiration date, this field would indicate when the membership expires. This date is usually a future date for the currently active memberships and a past date for the expired ones. The End Date can also indicate the date when a user has cancelled their membership. This means that if a user cancels before the membership expires, the End Date would actually reflect the date of the cancellation. The Paid Memberships Pro Lifetime Value field shows the total amount that each user has paid so far. By using this field, you can easily find who your most valuable members are. The lifetime value is calculated by summing the total amount of all the successful orders for each user. This is a numeric field, which means that you can apply numeric operations to it. For example, you can find all the members whose lifetime value is greater or smaller than a particular value. As its name suggests, this field shows the date of the last successful PMPro payment for each user. You can filter the member list by this field and you can combine it with any of the other fields to create a custom analysis. 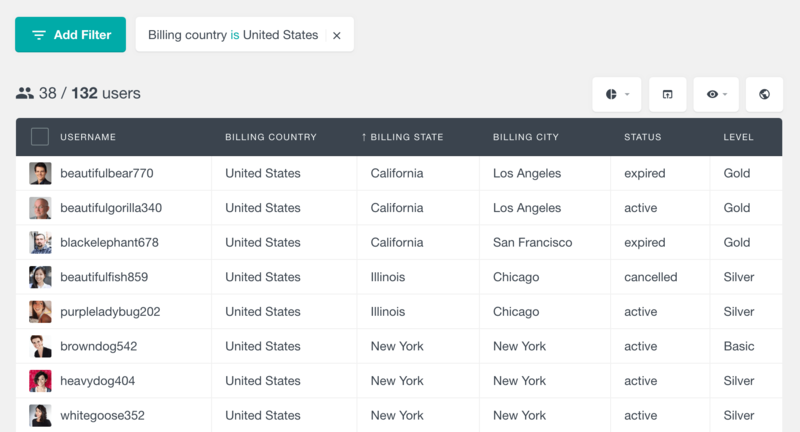 If you ask your Paid Memberships Pro members to provide their country, state and city on checkout, you will be able to load this data in the Users Insights table. Paid Memberships Pro stores the countries as an abbreviated code, however Users Insights maps those codes to the actual country names. Also, if you need to filter by country, Users Insights provides a list with all the existing countries that you can choose from. The state and city fields on the other hand are stored as plain texts, so you can use standard text searches like “City is” or “State starts with”. If you use discount codes to incentivize more subscriptions on your Paid Memberships Pro, you can use the “Has used discount” filter to find all the members who have used a particular discount code. This is a filter only, which means that it doesn’t have a corresponding column in the user table. However, if you need to find more info about the usage of the discount code, you can find all the details in the profile section of each member. The Users Insights user profile is where all of the available data for each user comes together. While the user table can show you a bird’s-eye view of your member data, the user profile provides a more detailed overview of each user. This is where you can view their membership history, personal details and general data & activity available by other 3rd party plugins. In this section, you can also tag your users by using the Groups feature and attach custom notes to your members, that you can share with your team. The user profile includes a detailed history of the Paid Memberships Pro activity for each member. If a member has changed their membership over time, you will be able to see the list of all previous memberships for this user. For each membership you can see the name of the Level and its current status. This is followed by the fee that this member is paying for the level. In some cases this fee can be different from the actual fee of the corresponding level, for example when the user has used a discount code. The start and end date (when available) of each membership are also listed. And finally, the list shows how many payments the member has made for each membership. If you click on the number of payments link, you will be redirected to the Paid Memberships Pro Orders page, which is filtered to show the orders for this particular user and level. Another PMPro element that is available in the member profile, is the Discount Codes Used section. This section lists all of the Paid Memberships Pro discount codes that each member has used along with the order, in which the code was used. The Users Insights Export feature allows you to create custom exports of your users in a CSV format. It works similarly to creating a snapshot of your current user table setup. This means that after applying various Paid Memberships Pro filters and selecting the visible columns, you can export the same results that you are seeing on the table. Users Insights includes many other features and integrations that are not covered in this article. So, you can combine any of the Paid Memberships Pro fields & filters with the rest of the features. For example, you can use the User Groups feature to tag your members or the Custom Fields feature to update, search and filter user meta data. Or if you are using any of the other 3rd party plugins that Users Insights supports, you can also use any of the filters that they provide. For example, you can further search your users by their BuddyPress activity, LearnDash course completions or WooCommerce orders if you are also using WooCommerce. To learn more, head over to the Features and Integrations pages. 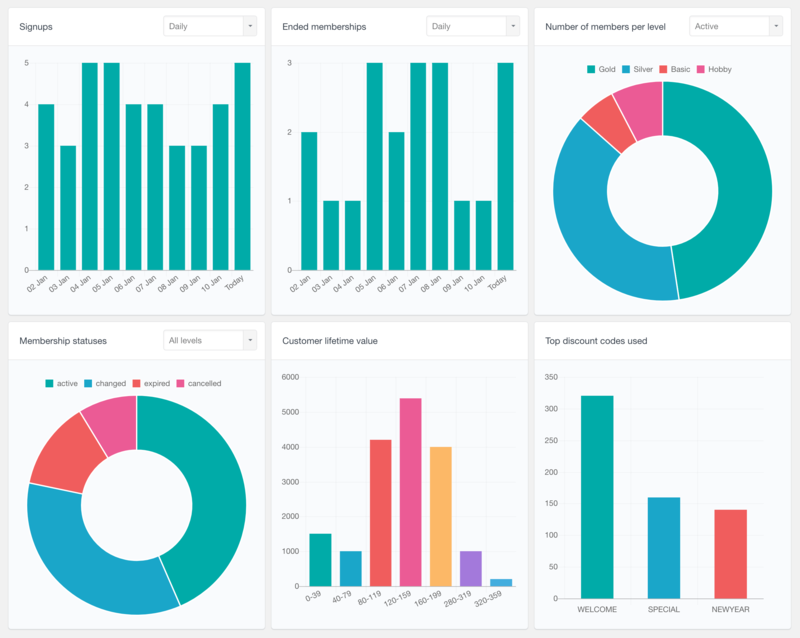 The Paid Memberships Pro module of Users Insights also comes with a Reports section that visually represents your site’s membership data. It’s a great way to get an instant overview of your membership site performance with the help of various interactive charts. To learn more, visit the Paid Memberships Pro Reports page.